When my daughter was born with a heart condition requiring a high level of medical care, I became her advocate. When I realized there were many kids like her, unable to access the resources they need to survive and thrive, I became a leader. The truth is, I never thought I would be a health care expert meeting with legislators in our state Capitol, but now I am. Because I have to be. Too often, our policies on health care are made by people who do not understand what it's like to care for a child who has had more doctor's appointments than play dates. That is why I started speaking up and fighting to change our state law. I started speaking up because of my daughter, Claire, a very happy four-year-old child. She loves to tease her siblings and will pull out all the stops to make them laugh. She loves music and she loves to play dress up. She currently attends an inclusive pre-K program, where she signs her best friend’s name “poppy” by using sign language for “bubble". In many ways, she’s just a kid living her best life; but unlike most kids, she has spent more than her fair share of time in hospitals, racking up millions of dollars of medical bills in the first two weeks of her life. We were very fortunate to be covered by my employer’s commercial insurance plan to pay for her medical care. In addition, due to Claire’s extended hospitalization, we also qualified for our state’s Medicaid plan, called TennCare, as a secondary policy. This was necessary because as great as our insurance was, it did not cover everything Claire needed, like her therapies, medical equipment, and surgeries. Then, one day, just prior to Claire’s 4th birthday, we lost her Medicaid because we no longer qualified. Just like that. I appealed not once, but twice and lost. How could a disabled child be denied access life-saving medical care in America? I sat in the grocery store parking lot crying one day, and I knew I had to do something. I have to confess that a year ago, I had no idea who my State Representative was. We all start somewhere. I began a letter writing campaign and asked everyone I knew to join me. I connected with groups like Little Lobbyists, a family-led organization advocating for children with complex medical needs and disabilities, where I felt encouraged and a sense of community. I made calls to my State Senator. I reached out to several agencies. I attended health care forums. I took notes as candidates campaigned for the mid-term elections. After tucking my kids in bed, I spent my late nights reading and learning about our state government. I learned about the Katie Beckett program, a Medicaid waiver program that allows medically complex children to live at home with their parents instead of an institution, by waiving the parent’s income. I learned that Tennessee was the only state in the country without this program. I told my story in several newspaper and television interviews. This past October, my daughter’s face was the front-page center piece article of our local newspaper, talking about why we need the Katie Beckett program. I joined four other families with children like mine, and we took off to our state Capitol. That day, my husband and I took our daughters to meet various lawmakers who agreed to sponsor a bill that we hope to become a Katie Beckett program in Tennessee. I remember we sat in a legislator’s office, next to Claire as she rocked in his rocking chair. When you show up with your kid at the state Capitol, legislators are forced to see them with their own eyes. Claire is not a number or statistic; she’s a real child. Our bill is now progressing in Tennessee’s House of Representatives. 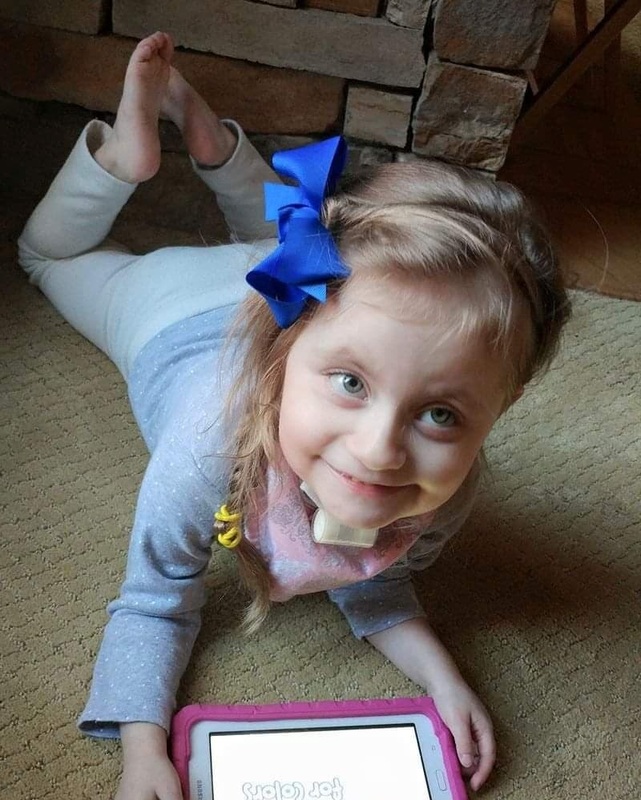 This bill, if passed, will ensure Claire can access the medical care she and so many other kids need and for us, that means we give them every fighting chance to reach her their highest potential. This is why we need to engage our lawmakers. They work for us. They need to understand how policies affect our lives. We are the experts on our children. We are the experts on policies that affect our children. We are constituents. We are real people, who care about our loved ones. We are spouses and siblings and friends and neighbors, and yes, we are parents. It is time for us to speak up and lead. Some of the Tennessee families fighting for a Katie Beckett Medicaid waiver in their state. Jessica gave this talk on the Spark Stage at the Urig Summit in Nashville on March 30, 2019. My 7-year-old son Colton is in hospice. Our entire family has been gathered around his bedside for weeks. His health, which had been slowly declining for over a year, rapidly deteriorated the day after Christmas. I’m grateful that he made it to Christmas, my smiling boy’s favorite time of year, to give us the gift of one last holiday together as a family. The time will soon come when his broken body will be at rest, and my constant fight to ensure his access to health care will become a distant memory. But not yet. Even in these final moments, when I should be able to focus the whole of my broken heart on saying goodbye, our fight is not over. Once again, our health care system has failed us. Once again, I am consumed by the fire of outrage at the suffering our children are needlessly forced to endure. Obtaining hospice care for a medically complex child like my son is no easy task. The flat rate allocated for home hospice by Medicaid is not enough for a child like Colton; who needs a trach, feeding tube, supplemental oxygen, ventilator, medical supplies, medications, and more (we don’t call him our “million dollar kid” for nothing). Negotiating difficult contracts with agencies to set up care was complicated and stressful, to say the least. As Colton became more ill, he needed more pain medication to remain comfortable. The prescription was written, but when we tried to fill it the medication was denied. Over the next few days, the script was denied four times. No matter what our physicians and pharmacists tried, it would not go through. As we ran out of medication, my greatest fear as a mother was coming true - my child would die a painful death and there was nothing I could do to help him. The health care system in our country is so broken that it prevented my child from accessing the medicine he needed to ease his suffering in his final moments. Fortunately we were heard by the people who needed to hear us. We finally got the attention of the pharmacy responsible. They explained they had made a mistake due to confusion over a new law in our state and were correcting the situation. After more than a week of worry, pain, and distraction, Colton finally got the medication he needed. I’m filled with relief and gratitude that my beautiful little boy will not have to endure unnecessary suffering at the end of his life. But I cannot stop thinking about all the other mothers who are facing the death of their child. We should not have to fear the loss of health care coverage while we are trying to say goodbye. This is excruciating enough -- without fighting for hospice, without needing a “GoFundMe,” without exposing ourselves in our most vulnerable moment to the public scrutiny of social media in the hope that sharing our story will facilitate access to desperately needed care. This is wrong. In his all-too-brief 7 years, Colton has taught me so many things about strength, and love, and the gift of life. To all who hear his story, I pray you learn just one thing from him – that the right to health care extends throughout a person’s life. My child deserves to live with dignity and as free from suffering as possible from the time he was a newborn in the NICU all the way to this moment in hospice, as he lies beside me struggling to hang on for just one more day. Image description: Tonya (the author) and her son Colton embracing nose to nose.